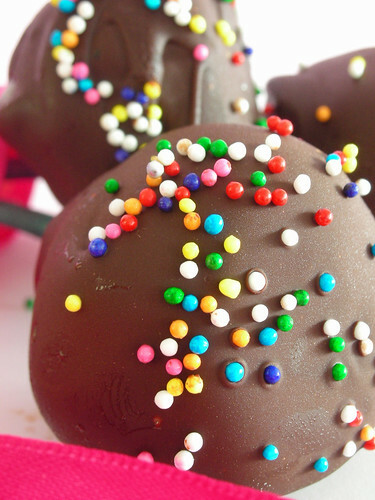 I love all of your cheesecake pops! They look fabulous. I would love to try the ones with the almond cookies and cinnamon, classic! The photos are terrific! Mine were rather “individual” too. =) But extremely tasty. Fun pics and they look wonderful! I wish I could figure out how to hide things in them, it must have been amazing. Nice creative touch with the almond cookie crumbs. They look adorable! Love the ones with cookie dust! Lovely, lovely, lovely!!! I love the idea of hiding jam in the middle. Fantastic! Too cute, and your photos are just fabulous. I felt like I could reach out and eat one. I bought the last pop sticks at my store, hard to find they are.Well done! Oh you sneaky person you! I was thinking about doing a center too…but got too lazy. Very nice work! I think this has been one of the most photogenic DB challenges yet, everything looks so good! Amazing and lovely, my kids want some too! The food processor! I’ll have to try that sometime. I love hundreds & thousands too, and who couldn’t smile, looking at such lovely pops! 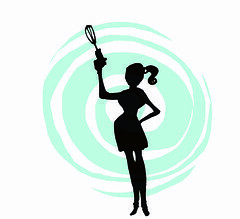 I’ve never tried a cheesecake in the food processor, I’ll have to remember that! Great job on this month’s challenge. I’m glad they put you in a cheesecake mood! your pops are so pretty! I’m glad you didn’t skip out on this one:) Great photos! Who could actually resist such nice looking cheesecake pops 🙂 they are absolutely lovely! 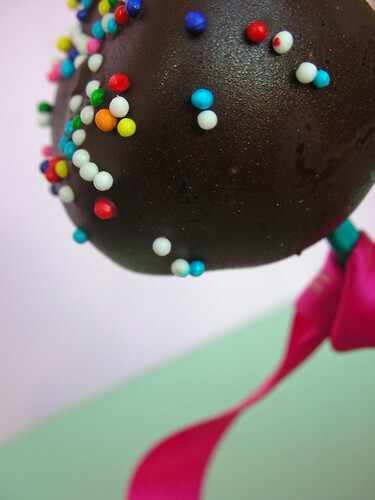 Your cheesecake pops look so cute! I really like the ones with the cookie crumbs! I’d have been happy to send you some lollipop sticks Steph! 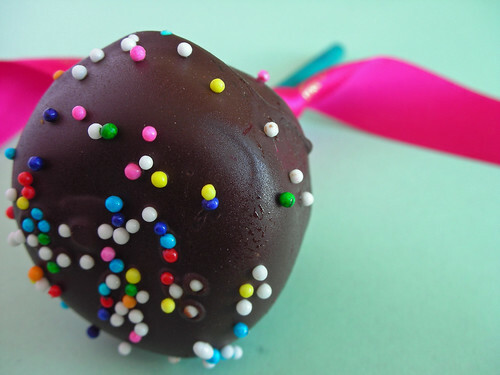 Your pops look so cute with the little bow and sprinkles. They look great. The cinnamon was a fantastic idea! Ohhh! The strawberry jam and almond has me going. Loevely! I always look forward to your creations and once again, you certainly do not disappoint. Beautiful! Great looking pops! I wish I had thought of the jam idea… I bet they taste like heaven. Great job! yumm! 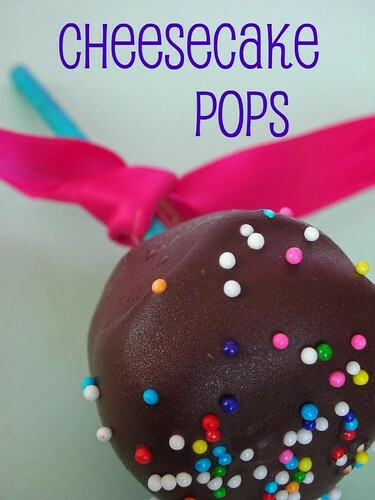 I love the idea of sneaking strawberry jam inside of the pops! great job! You’re right, the photos are great! I looove hundreds and thousands too! I couldn’t find any so ended up with rainbow jimmies instead. Great job on the challenge! 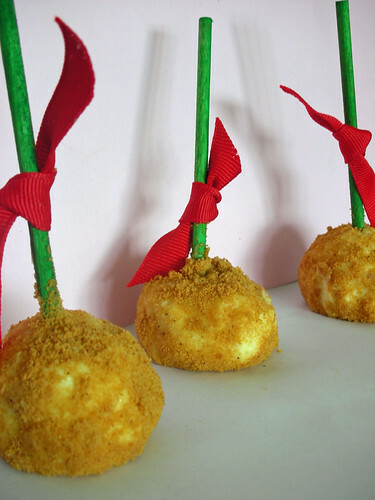 Beautiful looking cheesecake pops!! The one with strawberry jam stuffed inside sound wonderful. Gorgeous! I like the craft sticks – I’m assuming you’re all still living, right? these are gorgeouse. And you are right , the cuteness factor is over the top! They are so pretty! Very fun! They are so simple yet so sweet! amazing photos! Your pops look absolutely fantastic! Great job! Adorable looking pops!! Great job! Starwberry inside the pops and crust on the outside–brilliant! I love your pops! They look so cute. The almondy ones with the jam sound wonderful! your pops came out looking lovely, all in their individual way! sneaking strawberry jam inside sounds perfect! WOW…absolutely pretty & perfect!! What nice pops you put together…very nice! Lovely pictures too!! Absolutely gorgeous! I am finally going aroud everybody (well, almost) so sorry if this has been said before, but they do llok absolutely perfect!